To avoid misunderstandings in restaurants and bars, let's learn a few basic food and drink ordering phrases in Portuguese. Writing: Garconete podemos fazer o pedido? Writing: O quê que gostarias de comer? Do you have Coca Colo? How much is the beer? Writing: Quanto custa a cerveja? Can I pay for the juice? Writing: Posso pagar o sumo? Writing: Posso pagar com dinheiro? 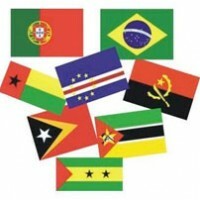 Is the official language in nine countries: Brazil, Mozambique, Angola, Portugal, Guinea-Bissau, East Timor, Equatorial Guinea, Cape Verde, and São Tomé and Príncipe. How do you say "You have a lovely smile" in Portuguese language? Expand your seduction skills by going international. Family is THE most important thing in the world. Let's learn how to say mom, dad, granny and much more in Portuguese language. Basic words to get familar with Portuguese language for the very first time. You will learn how to say hallo, bye and similar. Nature is everything around us, we are nature and we should be doing everything in our power to preserve it. Now let's learn about nature in Portuguese. We need to relax more in this time and age and having fun sounds like a great way to forget about the daily routine. Let's have fun in Portuguese language! Numbers are basically universal but pronunciation and writing are different in pretty much all languages and Portuguese language is no exception.